We have talked about the “who” (our target audience), we have talked about the “what” (products and services our prospects will buy from us) and now we can go into the “where” – target markets. 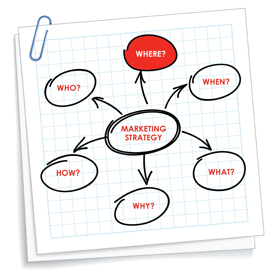 Understanding the “where” of staffing firm marketing strategy allows you to penetrate new verticals. Understanding “where” allows you to determine whether you will take a long-line approach or local office approach. Understanding “where” allows you to focus your efforts on the greatest chances for success. Open an office or work remotely? We have decided to expand our operations and we need to determine the best approach. This decision should be based on a number of things. Expanding into a new market has several challenges. The first of which being…is there business there? However, the next question becomes do we have current employees willing to move there? Are our systems built to expand into new markets? Is our culture strong enough to be replicated elsewhere with less interaction from you? Believe it or not, one of the strongest arguments in favor of long-line vs. new office is that the culture of your business is not as replicable as you would like it to be. If what made your firm a success was your tenacity and unyielding commitment to being great for your clients, consultants and employees, but you are not going to be the person opening and running the new office, then there is a good chance that there won’t be a commitment to that same level of greatness. Many companies have had trouble expanding simply because they could not replicate the culture. Think about the strength of your organization before you decide long-line or local because long-line allows you to work the market remotely, perfecting what you need to perfect before you put yourself into this situation. Are you in the wrong market? We have all been a part of offices that opened because there was built in demand or offices that our clients wanted us to open. The fact is that we have all opened offices for a variety of reasons and a large portion of those offices are either no longer open or not doing particularly well. If you really think about it, very few pieces of data drove the decision to have this office and the question becomes: what is the right kind of data and what is the right amount of data? Your marketing strategy will drive successful offices. We need a map and we need data. We need to mark the map with every current client location that has a need for your services. Do we know how many people they use? Do we know what departments utilize our services? Do we know the management? Do we have a champion from outside the market bringing us in? In our existing clients, we need to begin truly probing for information with the intent of collecting the data. Do we know that our clients have needs in this market or is it simply anecdotal conversations? Where do you focus your efforts? Which industries should I be targeting with my staffing firm marketing strategy? When asked, most companies would say that they have a targeted list of companies that they focus on, but the list covers everyone. Are you industry focused or can you be everything to everyone? That is one of my favorite questions because the staffing industry has the ability to be incredibly nimble. However, consider the traction that your team will get when there is a definable and repeatable story because you are incredibly focused. Your success will be expandable because you built a process around it and it will be replicable to other industries. Focus your efforts around a few things and you will be better for it.